A God sized dream became realized over the weekend. 1700 women from all over the world gathered in small groups to share life together. Introverts, extroverts, single, married, leaders, followers, a magnificent paradox of people created real life community that was “seeded on- line” but came to fruition in real life. 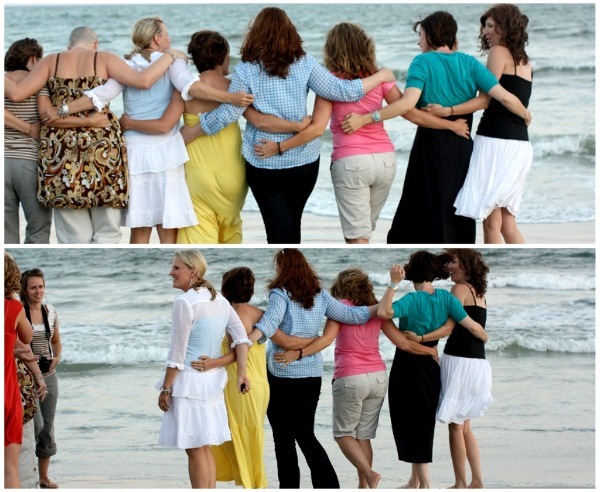 The Lord used (in)courage’s in real life weekend to speak differently to each woman. He opened eyes, quieted hearts, restored relationships, birthed friendships, and allowed Life (yes, with a capital “L”) to bloom. I have no beautifully poetic words to describe this, so I’ll just state the fact. Community is hard. As we shared in the keynote, it can be scary, and it can hurt. Yet the Lord, in his infinite wisdom, wired us to crave community, and when true Koinonia occurs, it points others to Him. Referenced nineteen times in the New Testament, the Greek root for fellowship, Koinonia, is also translated by the words, “participation and sharing.” Commentaries suggest that Koinonia always includes action in its meaning. Did you catch that, ladies? Action! Community is not just about being together, it’s about doing Life together. That’s why I typically refer to Life with a capital L? I want to be intentional with my moments, but it’s more than just living Life to its fullest, it’s about doing Life together. It’s about bringing both our beauty and our bedlam to share with each other. As a guest in our home, friends are greeted with this reminder. Can we truly celebrate both our beauty and bedlam? It’s my heart’s desire. On-line community is precious, and offers many of us a place to be ourselves when we feel there’s no where else to turn. My on-line community has encouraged me during moments when I most needed it, yet true koinonia shares all kinds of life together, in real life, in real time, and not just on blog time. A problem with on-line community is that it’s on our time. Life is done on our blog time. It’s community when it’s convenient. It’s community when I decide I want it to be. It’s community when I decide to comment, or ignore a comment, but that’s not reality in true fellowship. Some of you look at this picture and dream of a perfect christian community. This picture seems to symbolize what that might be, but in reality, many women in this picture carried heavy burdens that weekend. Some even felt as if they didn’t fit in or belong, yet all of them, all of us there, desired to be the hands and feet of Jesus to others. That, my precious sisters, is real life community. In those vulnerable moments, the Lord meets us and whispers His love words to our heart and reminds us that He is enough. For me, in the midst of those times, I pray and ask the Lord to bring just one person to walk along side me, and He always answers. Now, His time table may not always be my time table, but He answers, and while I wait, I grow and learn and reflect. We’ve spent all month talking about community. We’ve shared vulnerably about how community can make or break us, and tried to be practical with some action steps on building community right where you are at, regardless of life stage or location. Now, I would love to hear some of your reflections. Do you have one take away point that you planning on implementing in your own life? For me, I am going to start up my Kitchen Sister’s Club again. It was a wonderfully practical way of making meal time madness magical, while enjoying an intentional time of fellowship and sharing together with my friends. Yes, it’s work, but it’s worth it. I first shared this at (in)courage here (comments are open there). 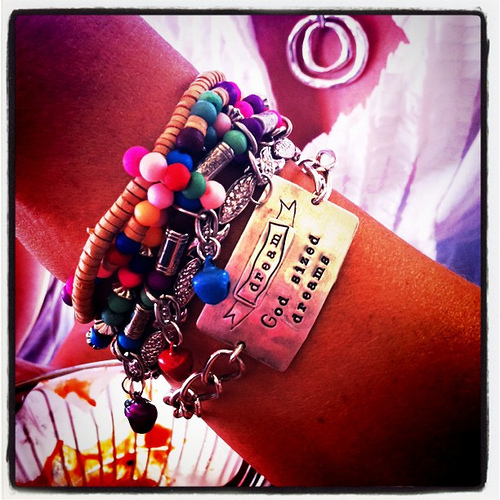 I love, love, love that ‘God sized dream’ bracelet, PLEASE tell me where I can find one!!!! You have an amazing blog! I too would love to know where I can get the bracelet pictured. Our church is going through a series called, 60 days of dreaming, and we are learning about God’s dream for us…..I would love to have one of these bracelets to wear as a reminder while going through this journey. Email me if possible. Thanks so much! THANK YOU!! I would LOVE to be able to purchase a few for the dear ladies in my bible study. Please let me know if she responds to your email or feel free to pass mine email address on. I Love this post… I also love the bracelet! So pretty! I also love the delighted sign! I need to try and replicate it! I found you through the (in) community, and am so glad that I did.